Join Pokeshot///SMZ at Jive’s leading social business event from October 22nd–24th in Las Vegas. 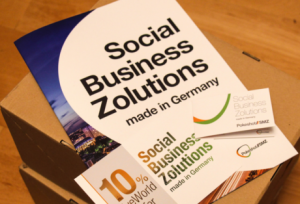 The Berlin-based social technology experts are doubly thrilled to announce their participation: not only is the company a silver sponsor of this year’s conference, it has also been selected as a finalist in the Jive Awards. A sponsor of the event for the second year in a row, Pokeshot///SMZ is proud to have been selected as a finalist in the prestigious Jive Awards, which honor companies deploying cutting-edge strategies for collaboration and community development. The company will appear on the final award ballot in the Extend Jive category for its innovative social learning management solution SmarterPath. Winners will be announced on October 24th on the conference’s main stage. The conference also gives Pokeshot///SMZ an opportunity to provide in-depth information about its full range of products and services at the conference. This will include demonstrating how its newest business communications solutions can help organizations expand the capabilities of their Jive-based environments. Our experts for professional services and products, Stephan Müller-Ziebur and Nils Heuer, plus our expert for consulting services, Christoph Rauhut, will also be on hand to share their expertise and insights on Jive and social business. We’re looking forward to seeing you at our booth S12 in Gracia Commons. Learn more details. In addition, our product guru Nils Heuer will be speaking at the “JiveTalks: Developer” session about up-and-coming apps for Jive 7 and how learning management is being transformed through collaboration. This talk will take place on Thursday, October 24, from 1–2 p.m., at Gracia 5&6. For more details, please visit. We hope you are also eagerly anticipating JiveWorld13 and will be pleased with what we have in store for you. Drop by our booth and find out how we can help your organization get the best results from social business technologies. As a leading full-service software consultancy and technology provider, Pokeshot///SMZ empowers your organization to get the most from social business technologies and achieve sustainable success. We work in close partnership with clients to define, design and implement social software solutions that drive engagement and increase productivity. This is what makes us the leading Jive Consulting and Professional Service Partner in Europe. Our more than eight years’ experience in diverse national and international projects gives us an understanding of the challenges that businesses face every day. A team of knowledgeable and creative professionals as well as a solid network of partners enable us to deliver solutions that solve these challenges and make our clients more successful – not only today, but well into the future.